the basics. To begin, this book addresses the two fundamental concepts that programmers must grasp in order to write a professional object-oriented C# application: the nature and characteristics of objects, and the structure that allows you to take best advantage of C#s object-oriented makeup. In addition to the basics of C# syntax, this book introduces object terminologyâ€”teaching you how to think in terms of objectsâ€”and provides an introduction of object modeling, illustrating how to translate an object model into C# code with ease. For folks who have already attempted to learn C# but are still having trouble mastering C#'s object-oriented nature, the case study format of this book will be invaluable in showing you how to translate a UML model into a fully-functional C# application. An overwhelming number of programmers are now moving to C# as their language of choice for developing powerful, maintainable, scalabe software applications. 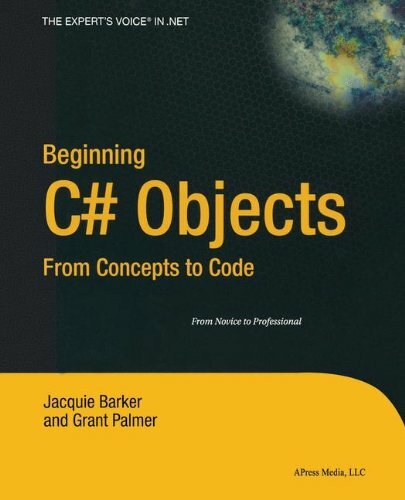 Whether you're learning C# as your first programming language, moving to C# from a non-object-oriented language, or have previously programmed with C# but still feel unsure when it comes to object aspects, this book is a perfect fit for you.